Riding on bald tires isn’t safe, but you shouldn’t wait until they’re at 2/32nds of tread left before you start thinking about replacing them. 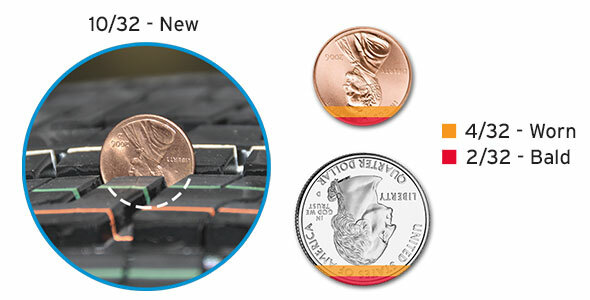 The penny test is probably the best known means of quickly checking your tread, but if you don’t have a penny on you, a quarter will work too! Both Abe and George can help you out. We don’t want someone buying tires who doesn’t need them, but the difference between new tires and bald ones is pretty startling–especially on wet roads. 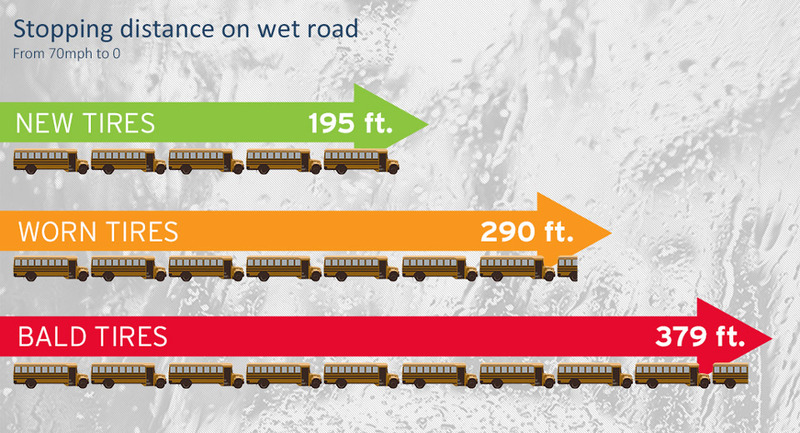 As you can see below it takes nearly twice as far to stop on wet pavement on bald tires than with new ones. Unless you’re related to Evel Knievel you probably want to line up fewer, not more, school buses. You can find all this and more in our in-depth article dealing with tread depth here.